Hi Old Silver, No More Away. Now where to find one of those little silver plaques engraved with “Listerine®” to hang around its neck? In my office, I use julep cups to hold pencils and a cigar box to hold correspondence cards and a few odds and ends. But I like the idea of being able to get the silver out. An old cigarette box is great to use for cufflinks or your watch and looks very elegant on your bureau. Now what could be easier? This entry was posted in Living and tagged bath, interior decoration, Living. Bookmark the permalink. 14 Responses to Hi Old Silver, No More Away. sobbing here… i used to use the julep cups from one of my elderly cousins (he used to have his secretary order them for everyone each year at christmas) for holding pens and pencils and paint brushes. they were all stolen when my house was robbed a year ago. i used to use christening cups i would find a junque shops for q-tips & cotton. but they’re gone, too. sniff, sniff…. That’s awful, Fairfax. Time to start anew. Mine are all pewter, of course. Most contributions here go immediately to the Whisky Relief Fund instead of to the silver collection. A decorator I once greatly admired always used her family’s old christening cups for mounded arrangements of pink carnations. Very smart looking, I must say. But you have to PACK the carnations so they look less like an assemblage of individual flowers and more like a single pink sphere. A 1920’s size martini would fit nicely and remain un-watered down… Ink well? I can relate, even paddle fish roe is getting horribly expensive. Aesthete, they’ll make an appearance on my next dinner table, thanks! Immediately thought of you when I spotted it. Mrs. PVE, how could I have missed it? Off to “research.” Thanks! I use my grandmother’s silver bowls as candleholders. Some are rather lovely with blue glass insides and may have been for salt or mustard (I should look them up in an antique book) and are only small, they just take a tea light candle so I buy nice scented versions for them. One of her crystal decanters holds pretty coloured bubble bath. I like new uses for old things and love the mouthwash idea. Perhaps a novel suggestion, but in my neck of the world people drink from their julep cups. There is very little more satisfying than a glass of sweet tea in a sweating beaker of Kentucky or Tennessee coin silver on a hot afternoon. It also goes quite well with more potent libations. Mrs PVE is correct. Silver is wonderfully displayed but even better used. My julep cups are displayed on a mantel and huntboard while the flatware is in the corner cupboard. Ah bliss. Jacqui O, great suggestions, thanks! theo, we have very good friends who serve ICE cold drinks in sweating silver julep cups at every party. They must have a collection of 100. I have one silver julep only pressed into service for bourbon and ice on very hot days. 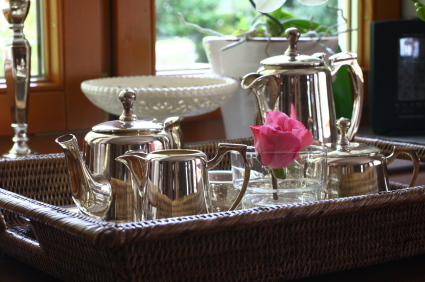 The pewter ones get used as decoration. What a lovely idea to use a crystal decanter for mouthwash. I also think old silver trophies make great make-up brush holders. I have a friend who uses some old trophies as vases for flowers. They look great on the table. we use our silver every day AND i put it in the dishwasher (i know…the horror!) i figure, it’s so pretty, why not? i have to replace a piece here and there when someone lets a knife blade touch something but our silver is not antique and it’s easily available. we might as well enjoy it every day instead of 5 or 6 times a year. i should confess i have the dishwasher with a separate cutlery tray at the very top that keeps things from touching and i do use non-chlorine, non-phosphate dishwashing powder (available at kroger). and since i am already rambling and talking about dishwashers, it is a terrible machine. i should have bought another bosch. the entry level bosch is better than my washer and half the price. mistake! Hello DD, thanks for dropping in. I’m very glad to hear that you use the silver everyday (as do we.) Since it’s antique (and the everyday stuff was bought after The War, since the rest of the silver left with the visiting Yankees) we don’t put it in the dishwasher, the knives wouldn’t take it. Good tip on the Bosch, we’re about to be in the market for a new dishwasher. Thanks again!